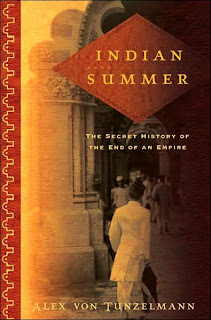 "The best book of 2009, for me, was "Indian Summer: The Secret History of the End of an Empire" (pub Sept 2008), a book which largely deals with the relationship between Louis and Edwina Mountbatten, and their friend Jawaharlal Nehru. The author, Alex von Tunzelmann, having researched her subjects and the dizzyingly complex background with rare insight, writes with sympathy and skill. Like so much good non-fiction, the story reads like an incredible novel. It's a tale of incompetence and missed opportunities on an international scale, but a very touching romance at a personal level. I also enjoyed it because it deals with my favourite subject, the British Empire, the history of which the British will, at some point, rediscover, learn from, and be proud of."